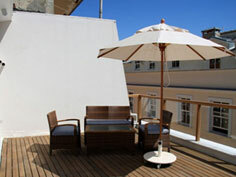 Sit in Istanbul in Style, soak up the rays in this rooftop terrace short stay rental apartment in central Istanbul. The whole building to which this apartment belongs has recently been renovated and refurbished. The whole apartment block is under professional management and if you decide not to soak up the rays on the rooftop (or it isn’t available) the other apartments are all stylishly decorated.